Making waves at several festivals before landing at the Portland Film Festival, ON THE FARM is a film that has been talked about for a while now. The film is a fictionalized account of the crimes of Robert Pickton who killed at least 49 women on his farm outside of Vancouver over a period of almost two decades- though told from his victims point of view. The short version of the real story is that Pickton and his brother had a farm that they converted to a non-profit center where people could hold events. The farm was used by various groups for raves, biker meetings and other fringe events. At some point people started to go missing from the events but no one paid any mind. Eventually the Canadian government pulled their non-profit status and things started to go south. Eventually a young woman escaped from Pickton and the police went calling and it was discovered that terrible things had been going on at the farm. Pickton confessed to killing 49 women but DNA of at least 80 people, men and women were found at the farm. It is believed that Pickton either fed his victims to the pigs on the farm or mixed them into his ground pork sausages. In the film we only get a small portion of the story as a woman escapes from the farm and is picked up by a passing car. 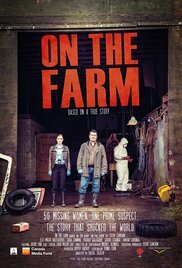 As she is in a hospital the story flashes back to her coming to Vancouver, getting in with the wrong crowd and eventually ending up at the farm where terrible things happen to her and a small group of Mounties try to figure out what the hell is going on at the farm. The problem with the film for me is that in structuring the film as a couple of women's tale, cop and victim, and by fictionalizing the events you've kind of dumbed things down and made it a TV Movie of the week (which it is the film was made for Canadian TV ). Any uniqueness is lost in the clumping of characters and events together to try and get the whole story out in under 90 minutes -The story is so complex that it needs to be much longer. There is a sense of things being left out. It's also clear that the film has an agenda as witnessed by the text that appears at the end stating that the Canadian government wouldn't be prosecuting Pickton further- leaving out the reason which was that that doing so would not keep him in jail any longer than he was going to be- life. It also leaves out that the cost of the case, including attempts to determine who and how many victims there were so the family could have closure was over 75 million dollars according to one account.